When you put the turkey in the oven, begin to make your turkey stock for the gravy. If your family doesn&apos;t like the liver bits, just leave them out, plus you can adjust how much of the giblets you want to add. Pull it all together with some juices from the cooked turkey as you finish up the last items for the meal. In 2-quart saucepan, place giblets (except liver); add enough water to cover. Add celery, onion, 1 teaspoon salt and 1/4 teaspoon pepper. Heat to boiling; reduce heat to low. Cover and simmer 1 to 2 hours or until giblets are tender. Add liver during last 15 minutes of cooking. Drain giblet mixture, reserving broth and giblets. Discard celery and onion. After removing turkey from roasting pan, remove 1/2 cup drippings (turkey juices and fat); reserve. Pour remaining drippings into 2-cup measuring cup; add enough giblet broth and chicken broth to measure 2 cups; set aside. Place reserved 1/2 cup drippings in roasting pan or 12-inch skillet. Stir in flour. Cook over low heat, stirring constantly and scraping up brown bits in pan, until smooth and browned. Gradually stir in 2 cups broth mixture. Cook, stirring constantly, until mixture boils and thickens. Remove meat from neck; finely chop meat and giblets and add to gravy if desired. Stir in salt and pepper. Expert Tips: Go ahead and make the giblet broth ahead of time. Drain as directed, then cover and refrigerate the giblets and broth separately. 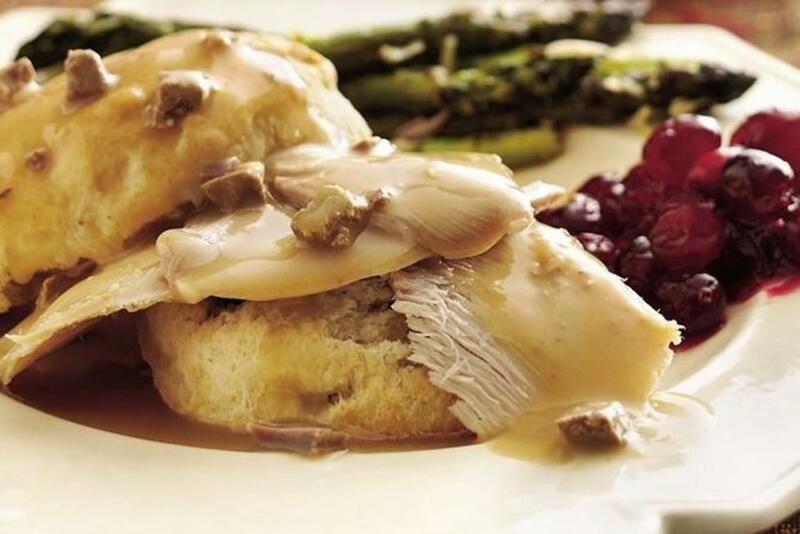 Any leftover gravy is great to serve over biscuits or open-face turkey sandwiches.